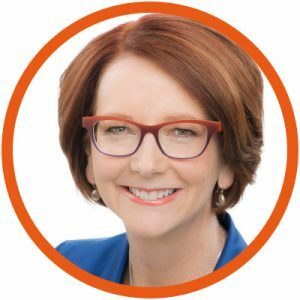 You are here: Home / Mental Health Week / Julia Gillard: What do you think is Australia’s most common mental health issue? If your answer is ‘depression’, then you have just given the same answer as 66 per cent of the people who participated in beyondblue’s community survey. Depression is the most common answer but it’s not the right answer. Anxiety is actually the most prevalent mental health problem, indeed twice as prevalent in any given year as depression. One in four people will experience an anxiety condition at some stage in their life. In any given year, 2 million people will suffer from a level of anxiety, which is persistent and debilitating. This is much more severe than the butterflies you feel when facing an examination, a performance appraisal at work, or giving a public speech. And it’s different to the flight response triggered if there is a dangerous situation. It is the anxiety, which manifests itself in unhelpful and more serious ways, that is cause for concern. It can start with jitteriness, a loss of appetite, constant sweaty palms and an elevated heart rate. You might throw up in the morning simply at the thought of going to work. You might be afflicted by panic attacks. Without any trigger, your heart will race and send you into a spiral. The feeling can be so horrible that you become terrified of experiencing it again. People can end up in hospital emergency departments, quitting their jobs, losing friendships or their independence because of anxiety. People often wait years before seeking support, sometimes because they fear judgment by others, and sometimes because they have misread the signs. The beyondblue community survey found that one in three people take a year or more to recognise the symptoms of anxiety. For one in six people, it can take six years or more. Anxiety can be hard to recognise because the symptoms can be incorrectly seen as part of someone’s personality, as a reaction to a situation or as a physical health issue. Even when people do recognise they have an anxiety condition, they sometimes delay getting help because they think the symptoms will disappear on their own, or that they will be seen as weak or over-sensitive if they do reach out. But failing to act can mean the anxiety just keeps get worse and it can lead to other problems, like depression or substance abuse. At beyondblue we want to help people recognise anxiety and encourage them to seek help early, before the situation worsens. This week we have launched a national anxiety campaign called Know When Anxiety is Talking. So what are some symptoms? Avoiding, or escaping from, situations that make you feel anxious. The sooner people identify their anxiety and get help, the sooner they can recover. The same beyondblue community survey found that 93 per cent of those who receive professional support find it useful. If you have anxiety, remember you are not alone and there is a vast amount of support available. And if you think someone you know may be experiencing anxiety, encourage them to seek help. Visit the beyondblue website to learn more about anxiety and how to seek help. Mental health professionals are available at the beyondblue Support Service via phone 24/7 on 1300 224 636 or via www.beyondblue.org.au/get-support for online chat (3pm–12am AEST) or email responses (within 24 hours).